This is the third and final part of the Humanity’s Fire trilogy which I have reviewed previously here and here. The Ascendant Stars follows the template set out before, a multi-stranded narrative which tends to break up the story’s flow. Indeed, Cobley’s fertile imagination has stacked his tale with so many alien races, so many strands, that sometimes it is difficult to keep track – even with a glossary and a dramatis personae. As in Humanity’s Fire’s part 2, The Orphaned Worlds, the focus is not so much on the Scots/Scandinavian/Russian world of Darien and its attendant moon Nivyesta – though the Legion of Avatars is finally loosed from its long imprisonment in the warpwell – and yet another new race, the Imisil, pops up to play a bit part. The Darien Scots are occasionally allowed to speak broadly but this dialogue, when it appears, somehow seems too out of place in all the intergalactic mayhem. Paradoxically if all the speech were in this vein it would perhaps be less noticeable. Two writerly tics were particularly in evidence here. Quite often our viewpoint character is in danger of some sort – of imminent death even – only to be saved by the intervention of a companion/third party and, as in The Orphaned Worlds, the formulations “seconds later” and “minutes later” abound. There is an almost breathless rush to pack in all the incident. And incident there is aplenty. There is so much plot going on here that in many cases it has to be told rather than shown. It may be that Cobley’s canvas is just too broad. Scaling down the action of a Space Opera is perhaps counter intuitive but doing so might have enhanced the human aspects of the story. With so much going on the characters do not get enough time to breathe as people. As a result the emotional pay-off of the dénouement lacks the impact it might have had. This is the second in the Humanity’s Fire trilogy, the first of which, Seeds Of Earth, I reviewed here. The usual caveat applies to the following. Once again the narrative is multi stranded and, once again, that makes the story fragmented. A new ingredient to the eclectic mix of races in the scenario this time is the introduction of another set of aliens, the Legion of Avatars, who have been kept imprisoned in the depths of hyperspace for aeons but who are set to break out and wreak havoc. In The Orphaned Worlds there is less emphasis laid on the Scots/Russian/Scandinavian planet of Darien and more on the interplanetary manoeuvrings – though at one point Cobley has one of the Scottish characters say, “no one strikes at us with impunity,” a nice restructuring of the old motto of the Kings of Scots. There is once more a surfeit of plot, so much so that the writing can seem rushed. Its exigencies, the necessity of moving characters from place to place, leads to phrases such as “en minutes later,” “after two hours,” “in half an hour,” abounding. Space for character development and exploration is thereby restricted. Those who prefer their plot to rampage, however, will find The Orphaned Worlds compelling. I wish though that Cobley had not chosen the name Uvovo for the aboriginal inhabitants of Darien. It reminds me too much of Vic and Bob’s Shooting Stars. Being the mid part of a trilogy there is some sense of marking time, of things moving into place. The denouement is, of necessity, not really conclusive but it nevertheless makes sense in terms of this book while setting up the trilogy’s final volume The Ascendant Stars. I reproduce below the latest information from my spoken word performance group, Writers’ Bloc. You’ll see the theme of this event chimes with a couple of the posts I have made recently. Leading SF and fantasy novelists Richard Morgan, Ken MacLeod, Hal Duncan, Deborah J. Miller and Mike Cobley discuss the shape of things to come with editor, critic and general ne’er-do-well Andrew J. Wilson at “The Early Days of a Better Future?”. Can things only get better or do we have to look over a mountain of rubble to see beyond the next fifty years? Scottish writers are leading a renaissance in British speculative fiction, but does our national identity have any future at all? Are rhetorical questions all we’ve got to offer? Join the panel for a lively debate punctuated with short, sharp and shocking stories — and some very special surprise guests. THE EARLY DAYS OF A BETTER FUTURE? Sunday 7 March, 20:00-21:30 at the Mitchell Library, Glasgow G3 7DN. Glaswegians who get to have their say. Throughout the 1950s, the early 1960s, through the late 60s efflorescence of the New Wave and into the 1970s and 80s a stream of English authors came to prominence in the SF field and had novels published in Britain. To my mind there was a clear distinction in the type of books all these authors were producing compared to those emanating from across the Atlantic and that certain characteristics distinguished the work emanating from either of these publication areas. While Bob Shaw was a notable Northern Irish proponent of the form during this period and Christopher Evans flew the flag for Wales from 1980 something kept nagging at me as I felt the compulsion to begin writing. Where, in all of this, were the Scottish writers of SF? And would Scottish authors produce a different kind of SF again? Until Iain M Banks’s Consider Phlebas, 1987, contemporary Science Fiction by a Scottish author was so scarce as to be invisible. It sometimes seemed that none was being published. As far as Scottish contribution to the field went in this period only Chris Boyce, who was joint winner of a Sunday Times SF competition and released a couple of SF novels on the back of that achievement, Angus McAllister, who produced the misunderstood The Krugg Syndrome and the excellent but not SF The Canongate Strangler plus the much underrated Graham Dunstan Martin offered any profile at all but none of them could be described as prominent. And their works tended to be overlooked by the wider SF world. There was, certainly, the success of Alasdair Gray’s Lanark in 1981 but that novel was more firmly in the Scottish tradition of fantasy and/or the supernatural rather than SF (cf David Lindsay’s A Voyage To Arcturus, 1920) and was in any case so much of a tour de force that it hardly seemed possible to emulate it; or even touch its foothills. David Pringle noted the dearth of Scottish SF writers in his introduction to the anthology Nova Scotia where he argued that the seeming absence of Scottish SF authors was effectively an illusion. They were being published, only not in the UK. They (or their parents) had all emigrated to America. Though he has since partly resiled on that argument, it does of course invite the question. Why did this not happen to English SF writers? It was in this relatively unpromising scenario that I conceived the utterly bizarre notion of writing not just Science Fiction but Scottish Science Fiction and in particular started to construct an SF novel that could only have been written by a Scot. Other novels may have been set in Scotland or displayed Scottish sensibilities but as far as I know I’m the only person who deliberately set out to write a novel of Scottish SF. It could of course simply be that there was so little SF from Scotland being published because hardly anyone Scottish was writing SF or submitting it to publishers. But there were undoubtedly aspirants; to which this lack of role models might have been an off-putting factor. I myself was dubious about submitting to English publishers as they might not be wholly in tune with SF written from a Scottish perspective. I also thought Scottish publishers, apparently absorbed with urban grittiness, would look on it askance. I may have been completely wrong in these assumptions but I think them understandable given the circumstances. There is still no Scottish publisher of speculative fiction. With Iain M Banks and Consider Phlebas the game changed. Suddenly there was a high profile Scottish SF writer; suddenly the barrier was not so daunting. And Phlebas was Space Opera, the sort of thing I was used to reading in American SF, albeit Banks had a take on it far removed from right wing puffery of the sort most Americans produced. Phlebas was also distant from most English SF – a significant proportion of which was seemingly fixated with either J G Ballard or Michael Moorcock or else communing with nature, and in general seemed reluctant to cleave the paper light years. Moreover, Banks sold SF books by the bucketload. As luck would have it the inestimable David Garnett soon began to make encouraging noises about the short stories I was sending him, hoping to get into, at first Zenith, and then New Worlds. That one was straightforward SF which could have been written by anyone. Next, though, he accepted This Is The Road (even if he asked me to change its title rather than use the one I had chosen) which was thematically Scottish. I also managed to sneak Closing Time into the pages of the David Pringle edited Interzone – after the most grudging acceptance letter I’ve ever had. That one was set in Glasgow though the location was not germane to the plot. The idea was to alternate Scottish SF stories with ones not so specific but that soon petered out. The novel I had embarked on was of course A Son Of The Rock and it was David Garnett who put me in touch with Orbit. On the basis of the first half of it they showed interest. Six months on, at the first Glasgow Worldcon,* 1995, Ken MacLeod’s Star Fraction appeared. Another Scottish SF writer. More Space Opera with a non right wing slant. A month or so later I finally finished A Son Of The Rock, sent it off and crossed my fingers. It was published eighteen months afterwards. I think I succeeded in my aim. The Northern Irish author Ian McDonald (whose first novel Desolation Road appeared in 1988) in any case blurbed it as “a rara avis, a truly Scottish SF novel” and there is a sense in which A Son Of The Rock was actually a State Of Scotland novel disguised as SF. Unfortunately the editor who accepted it (a man who, while English, bears the impeccably Scottish sounding name of Colin Murray) moved on and his successor wasn’t so sympathetic to my next effort – even if Who Changes Not isn’t Scottish SF in the same uncompromising way. It is only Scottish obliquely. So; is there now a distinctive beast that can be described as Scottish Science Fiction? With the recent emergence of a wheen of Scottish writers in the speculative field there may at last be a critical mass which allows a judgement. Probably not, even though putative practitioners are more numerous now – especially if we include fantasy. For these are separate writers doing their separate things. I’ll leave it to others to decide whether they have over-arching themes or are in any way comparable. PS. Curiously, on the Fantastic Fiction website, Stephen Baxter, Peter Hamilton and Alastair Reynolds are flagged as British – as are Bob Shaw, Ian McDonald, Christopher Evans and Mike Cobley – while all the other Scottish authors I’ve mentioned are labelled “Scotland.” I don’t know what this information is trying to tell us. *For anyone who hasn’t met the term, Science Fiction Conventions are known colloquially as Cons. There are loads of these every year, most pretty small and some quite specialised. The Worldcon is the most important, an annual SF convention with attendees from all over the globe. It’s usually held in the US but has been in Britain thrice (Glasgow 2, Brighton 1) and once in Japan, to my knowledge. The big annual British SF convention is known as Eastercon because it takes place over the Easter weekend. Edited to add (6/6/2014):- Margaret Elphinstone should be added to the list above of Scottish authors of SF. Her first SF book The Incomer appeared from the Womens’ Press in 1987, the same year as Consider Phlebas, but I missed out on it then. My review is here. See also my Scottish SF update. Edited again to add (4/4/18) Elphinstone’s sequel to The Incomer is A Sparrow’s Flight which I reviewed here. The author is another member of the Glasgow SF Writers’ Circle and as a consequence I have known him for many years. He is also one of nature’s good guys. The usual caveat therefore applies to this review. The Seeds Of Earth, part one of Humanity’s Fire, is set several centuries after an alien race called the Swarm had attacked the solar system. Three colony starships, Hyperion, Tenebrosa and Forrestal were sent out on random courses to preserve at least some of humanity from imminent destruction. The descendants of the Hyperion emigrés (of Scots, Russian and Scandinavian extraction) live on Darien, a planet which has a lush habitable moon, Nivyesta, to which many of Darien’s natives, the Uvovo, have moved. Darien’s galactic neighbourhood is also inhabited by a congeries of races some of whom have designs on the planet. The novel proper starts when contact from Earth – saved from the Swarm by one of the competing galactic powers – is finally established. Aside: Would colonists of Scots descent really accept the name Darien for a new world? Given the doleful associations of the real Darien Adventure I would doubt it. In Cobley’s scenario there is a lot of setting up to do. Back-story and explication are somewhat too in evidence in the early chapters. He uses a multiply stranded structure – each chapter has its own narrator whom we return to by (irregular) turns, with the inevitable corollary that the story is fragmented and, as is usual with this device, the reader develops a preference for some viewpoints over others. Cobley has a lot of plot to cram in. As a result many of the scenes – especially the action ones – feel a touch rushed but the political machinations of the alien incomers to Darien are believably Machiavellian and redolent of Great Power activities in our own, or any, time. The story only really gains momentum in Part 2 when we meet Kao Chih – one of the Tenebrosa Émigrés (kept in a kind of indenture on a secluded world far from Darien) – who is sent to Darien as a secret emissary. Much of the latter part of the novel deals with his misadventures en route. His arrival on Darien is, though, crucial to the dénouement. The book seems to stop rather than finish, leaving rather a lot unresolved. There is a strong unexplored hint that the Forrestal also managed to achieve a successful planetfall, for example. Seeds Of Earth is the first of a trilogy, of course, which may provide an explanation for the loose ends. 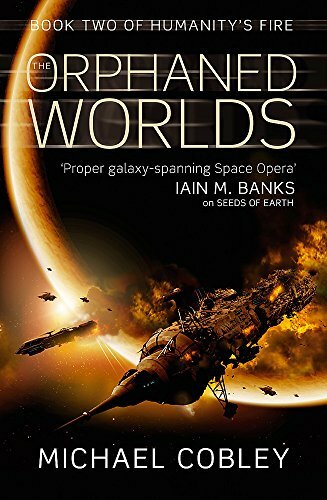 An eclectic mixture of Space Opera, quasi-police procedural and thriller, complete with bizarre alien transformations, ancient artefacts and their attendant guardian technology, plus betrayals galore, Seeds Of Earth has perhaps rather too much incident – even if there is a particularly fine edge-of-atmosphere dogfight in the ultimate chapter – but space for character development and exploration is necessarily restricted. I will, though, be looking out for the second in the Humanity’s Fire sequence, Orphaned Worlds.